Nvidia kauft Infiniband- und Ethernet-Technik fürs Supercomputing, Intel & Co präsentieren CXL. #NVIDIA acquires #Mellanox: yesterday‘s rumour became reality today. Why did they do that? #Datacenter operators accelerate computing power with NVIDIA #GPU‘s for increasing #AI or #DL/#ML workloads. Mellanox empowers networks to reach ever new speeds and nearly eliminated latency. Last is most important for cloud computing setups and the increasing number of service providers such as Zalando, booking or Amazon. The racy thing about the current acquisition is NVIDIA‘s engagement in future #technology like autonomous driving and industrial networks generally. Processing huge amounts of data in a maximum distributed environment is a big challenge – and in the case of selfdriving cars it becomes life critical literally. I understand, that a company like NVIDIA wants to get as much control as possible over as much components as possible. Or why would have been Intel so keen on the same subject? With picking the sweetest cherry from the tree NVIDIA gets an enormous head start in the race. Why did they do that? #Datacenter operators accelerate computing power with NVIDIA #GPU‘s for increasing #AI or #DL/#ML workloads. Mellanox empowers networks to reach ever new speeds and nearly eliminated latency. Last is most important for cloud computing setups and the increasing number of service providers such as Zalando, booking.com or Amazon. Nvidia's $6.9 billion purchase of Mellanox highlights the company's bet that next-gen data center architecture will revolve around data and artificial intelligence. NVIDIA and Mellanox today announced that the companies have reached a definitive agreement under which NVIDIA will acquire Mellanox. Pursuant to the agreement, NVIDIA will acquire all of the issued and outstanding common shares of Mellanox for $125 per share in cash, representing a total enterprise value of approximately $6.9 billion. Once complete, the combination is expected to be immediately accretive to NVIDIA’s non-GAAP gross margin, non-GAAP earnings per share and free cash flow. The acquisition will unite two of the world’s leading companies in high performance computing (HPC). Together, NVIDIA’s computing platform and Mellanox’s interconnects power over 250 of the world’s TOP500 supercomputers and have as customers every major cloud service provider and computer maker. The data and compute intensity of modern workloads in AI, scientific computing and data analytics is growing exponentially and has put enormous performance demands on hyperscale and enterprise datacenters. While computing demand is surging, CPU performance advances are slowing as Moore’s law has ended. This has led to the adoption of accelerated computing with NVIDIA GPUs and Mellanox’s intelligent networking solutions. Datacenters in the future will be architected as giant compute engines with tens of thousands of compute nodes, designed holistically with their interconnects for optimal performance. An early innovator in high-performance interconnect technology, Mellanox pioneered the InfiniBand interconnect technology, which along with its high-speed Ethernet products is now used in over half of the world’s fastest supercomputers and in many leading hyperscale datacenters. With Mellanox, NVIDIA will optimize datacenter-scale workloads across the entire computing, networking and storage stack to achieve higher performance, greater utilization and lower operating cost for customers. “The emergence of AI and data science, as well as billions of simultaneous computer users, is fueling skyrocketing demand on the world’s datacenters,” said Jensen Huang, founder and CEO of NVIDIA. “Addressing this demand will require holistic architectures that connect vast numbers of fast computing nodes over intelligent networking fabrics to form a giant datacenter-scale compute engine. The companies have a long history of collaboration and joint innovation, reflected in their recent contributions in building the world’s two fastest supercomputers, Sierra and Summit, operated by the U.S. Department of Energy. Many of the world’s top cloud service providers also use both NVIDIA GPUs and Mellanox interconnects. NVIDIA and Mellanox share a common performance-centric culture that will enable seamless integration. Once the combination is complete, NVIDIA intends to continue investing in local excellence and talent in Israel, one of the world’s most important technology centers. Customer sales and support will not change as a result of this transaction. Post close, the transaction is expected to be immediately accretive to NVIDIA’s non-GAAP gross margin, non-GAAP earnings per share and free cash flow. NVIDIA intends to fund the acquisition through cash on its balance sheet. In addition, there is no change to its previously announced capital return program for the rest of fiscal 2020. The transaction has been approved by both companies’ boards of directors and is expected to close by the end of calendar year 2019, subject to regulatory approvals as well as other customary closing conditions, including the approval by Mellanox shareholders of the merger agreement. Goldman Sachs & Co. LLC served as exclusive financial advisor to NVIDIA and Jones Day served as legal advisor. Credit Suisse Group and J.P. Morgan Chase & Co. served as financial advisors to Mellanox and Latham & Watkins, LLP and Herzog Fox & Neeman served as legal advisors. NVIDIA will conduct a webcast at 5:30 a.m. PT today to discuss the transaction. The webcast and a copy of the presentation materials can be found on NVIDIA’s Investor Relations website at https://investor.nvidia.com. A webcast replay and a copy of the webcast presentation materials will also be available at https://investor.nvidia.com. Mellanox (NASDAQ: MLNX) is a leading supplier of end-to-end Ethernet and InfiniBand smart interconnect solutions and services for servers and storage. Mellanox interconnect solutions increase datacenter efficiency by providing the highest throughput and lowest latency, delivering data faster to applications and unlocking system performance capability. Mellanox offers a choice of fast interconnect products: adapters, switches, software and silicon that accelerate application runtime and maximize business results for a wide range of markets including high performance computing, enterprise datacenters, Web 2.0, cloud, storage and financial services. More information is available at http://www.mellanox.com/. computer users fueling skyrocketing demands on the world’s datacenters; holistic architectures that connect fast computing nodes solving the demand issue for datacenters; the combined companies’ offerings, including technology for the next-generation datacenters and working with the leaders of Mellanox to invent the computers of tomorrow; combining the companies being a natural extension of their partnership and being a great fit; the combination enabling the creation of powerful technology and fantastic opportunities; the benefits of the companies’ common culture and it enabling a seamless integration; the world’s top cloud service providers using the companies’ products; NVIDIA continuing to invest in Israel; Israel being one of the world’s most important markets for innovation; customer and sales support not changing as a result of the transaction; the expectation that the transaction will be accretive; NVIDIA’s intention to fund the transaction through cash on its balance sheet; and NVIDIA’s continuation of its capital return program are forward-looking statements that are subject to risks and uncertainties that could cause results to be materially different than expectations. business operations; the business combination or the combined company’s products may not be supported by third parties; actions by competitors may negatively impact results; potential adverse reactions or changes to business relationships resulting from the announcement or completion of the transaction; there may be negative changes in general economic conditions in the regions or the industries in which NVIDIA and Mellanox operate; and other risks described in NVIDIA’s and Mellanox’s filings with the Securities and Exchange Commission (SEC). In addition, please refer to the documents that NVIDIA and Mellanox file with the SEC on Forms 10-K, 10-Q, and 8-K. These filings identify and address other important risks and uncertainties that could cause events and results to differ materially from those contained in the forward-looking statements set forth in this document. These forward-looking statements are not guarantees of future events performance and speak only as of the date hereof, and, except as required by law, NVIDIA and Mellanox disclaim any obligation to update these forward-looking statements to reflect future events or circumstances. In addition, actual results are subject to other risks and uncertainties that relate more broadly to NVIDIA’s overall business, including those more fully described in NVIDIA’s filings with the SEC, including its annual report on Form 10-K for the fiscal year ended January 27, 2019, and Mellanox’s overall business and financial condition, including those more fully described in Mellanox’s filings with the SEC, including its annual report on Form 10-K for the fiscal year ended December 31, 2018. The foregoing review of important factors that could cause actual events to differ from expectations should not be construed as exhaustive and should be read in conjunction with statements that are included herein and NVIDIA’s filings with the SEC. Except as required by applicable law, NVIDIA does not undertake any obligation to revise or update any forward-looking statement, or to make any other forward-looking statements, whether as a result of new information, future events or otherwise. NVIDIA can give no assurance that the conditions to the transaction will be satisfied. This communication is being made in respect of the proposed transaction. Mellanox intends to file with the SEC and mail or otherwise provide to its shareholders a proxy statement in connection with the proposed transaction with NVIDIA (the “proxy statement”), and each party will file other documents regarding the proposed transaction with the SEC. The definitive proxy statement will be sent or given to the shareholders of Mellanox and will contain important information about the proposed transaction and related matters. This communication is not a substitute for the proxy statement or any other document that may be filed by Mellanox with the SEC. Investors and security holders are urged to read the proxy statement in its entirety and other relevant documents filed with the SEC in connection with the proposed transaction or incorporated by reference therein when they become available before making any voting or investment decision with respect to the proposed transaction because they will contain important information about the proposed transaction and the parties to the proposed transaction. You may obtain copies of all documents filed with the SEC regarding this transaction, free of charge, at the SEC’s website (www.sec.gov). In addition, investors and shareholders will be able to obtain free copies of the proxy statement and other documents filed with the SEC by NVIDIA on NVIDIA’s Investor Relations website (investor.nvidia.com) or by writing to NVIDIA, Investor Relations, 2788 San Tomas Expressway, Santa Clara, CA 95051 (for documents filed with the SEC by NVIDIA), or by Mellanox on Mellanox’s Investor Relations website (ir.mellanox.com) or by writing to Mellanox, Investor Relations, Hakidma 26 Ofer Industrial Park Yokneam Israel, 2069200, IR@mellanox.com (for documents filed with the SEC by Mellanox). NVIDIA, Mellanox and certain of their respective directors, executive officers, other members of management and employees and agents retained, may, under SEC rules, be deemed to be participants in the solicitation of proxies in connection with the proposed transaction. Information regarding the persons who may, under SEC rules, be deemed participants in the solicitation of Mellanox shareholders in connection with the proposed transaction will be set forth in the proxy statement when it is filed with the SEC. You can find more detailed information about NVIDIA’s executive officers and directors in its definitive proxy statement filed with the SEC on April 6, 2018. You can find more detailed information about Mellanox’s executive officers and directors in its annual report on Form 10-K filed with the SEC on February 21, 2019. To the extent holdings of securities by each company’s directors or executive officers have changed since the amounts disclosed in each company’s respective proxy statement, such changes have been or will be reflected on Statements of Change in Ownership on Form 4 filed with the SEC. Additional information regarding these persons and their interests in the proposed transaction will be included in the proxy statement relating to the proposed transaction when it is filed with the SEC. These documents, when available, can be obtained free of charge from the sources indicated above. © 2019 NVIDIA Corporation. All rights reserved. NVIDIA and the NVIDIA logo are trademarks and/or registered trademarks of NVIDIA Corporation in the U.S. and other countries. Other company and product names may be trademarks of the respective companies with which they are associated. Features, pricing, availability and specifications are subject to change without notice. 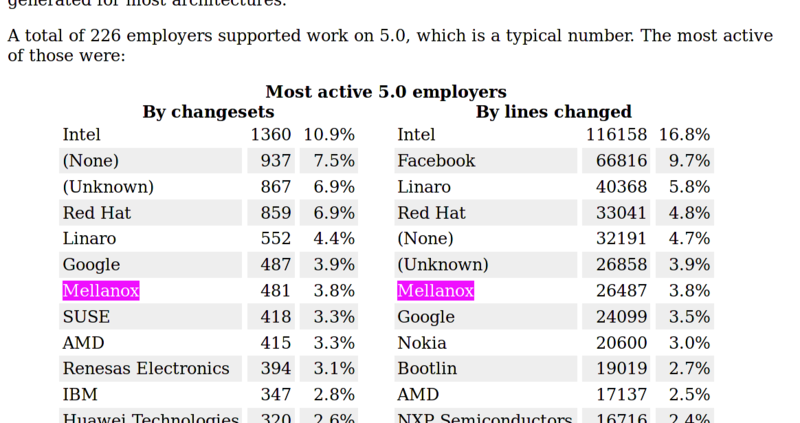 #Nvidia and #Mellanox were regularly among the top 25 companies contributing to the #Linux #Kernel recently. Together (nvidianews.nvidia.com/news/nvidia-to…) they afaics might hit the top 10. Updated: Nvidia has secured Mellanox for $6.9 billion following rumors of the deal.